We hope that you had a great 2018 and have a safe and prosperous 2019. The members of the Bushnell’s Basin Fire Association stand ready to respond to assist you in your time of need should it arise. We are your neighbors, friends and may even be your family members. Bushnell’s Basin Fire Association responded to over 500 calls for service last year while maintaining an all volunteer department. We invite you to come visit and even join this excellent team that provides Fire/Rescue services 24 hours, 365 days a year. Volunteer Fire Departments nation wide are experiencing a shortage of volunteers. Volunteers fire departments keep taxes low and provide a valuable service to the community. So, why not come and see us on a monday evening and think about joining in. Many of our members have as many as 3 and 4 decades of service. Our work is exciting, rewarding and could change your life. Training and equipment is provided free of charge. We also have an Explorer program for youth that is interested in fire fighting. There is also an amazing gym to help keep you in top physical condition for use free of charge. So what have you go to lose? Join with a friend or family member. Add some excitement to your life, set yourself apart from the rest and join the people that stand in the way of danger for their families, friends and neighbors. Strokes can be scary and can happen to anyone, but if you are able to recognize the signs and get help quickly your chances of making a full recovery are greatly improved. Take the time to learn FAST. 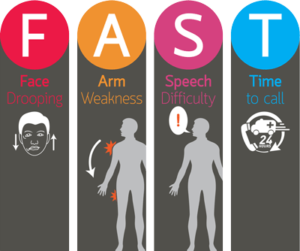 FAST is an easy way to remember and identify the most common symptoms of a stroke. T stands for TIME: If you observe any of these signs, call 9-1-1 immediately.